Almighty God, your Holy Spirit gives to one the word of wisdom, and to another the word of knowledge, and to another the word of faith. 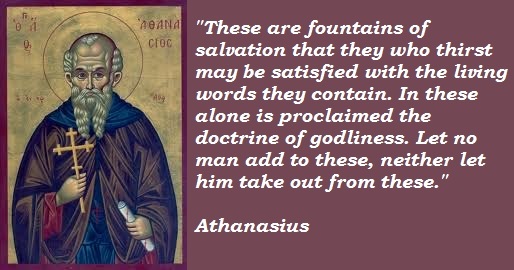 We praise you for the gifts of grace imparted to your servant Athanasius, and we pray that by his teaching we may be led to a fuller knowledge of the truth which we have seen in your Son Jesus Christ our Lord. Athanasian Creed, though not composed by Athanasius, is named in his honor because it confesses the doctrinal orthodoxy he championed throughout his life. His epitaph is Athanasius contra mundum, “Athanasius against the world.” We are proud that our own country has more than once stood against the world. Athanasius did the same. He stood for the Trinitarian doctrine, “whole and undefiled,” when it looked as if all the civilised world was slipping back from Christianity into the religion of Arius—into one of those “sensible” synthetic religions which are so strongly recommended today and which, then as now, included among their devotees many highly cultivated clergymen. It is his glory that he did not move with the times; it is his reward that he now remains when those times, as all times do, have moved away. And bring to nought all he has done.